Harrisonburg Fire Department's Peer Support Team consists of firefighters, officers, chief officers, retirees, and a chaplain. These members have a wealth of knowledge and experience when it comes to helping their brothers and sisters in the fire service. Thank you to the members of Harrisonburg, Rockingham, Augusta, Salem, and Fort Belvoir Fire Departments new Peer Support Teams! This group included fire, EMS, and dispatchers! Members of our Fort Belvoir, Joint Base Myer Henderson Hall, Chesterfield, Fort Myer, and Fairfax County Dispatch peer support teams! Members of the Augusta County Fire & Rescue, York County Fire & Rescue, and Henrico County ECC peer support teams! Members of Harrisonburg Fire Department, Harrisonburg Police Department, Rockingham County Fire Rescue, Harrisonburg-Rockingham Emergency Communications Center, and Staunton Fire Department Peer Support teams! 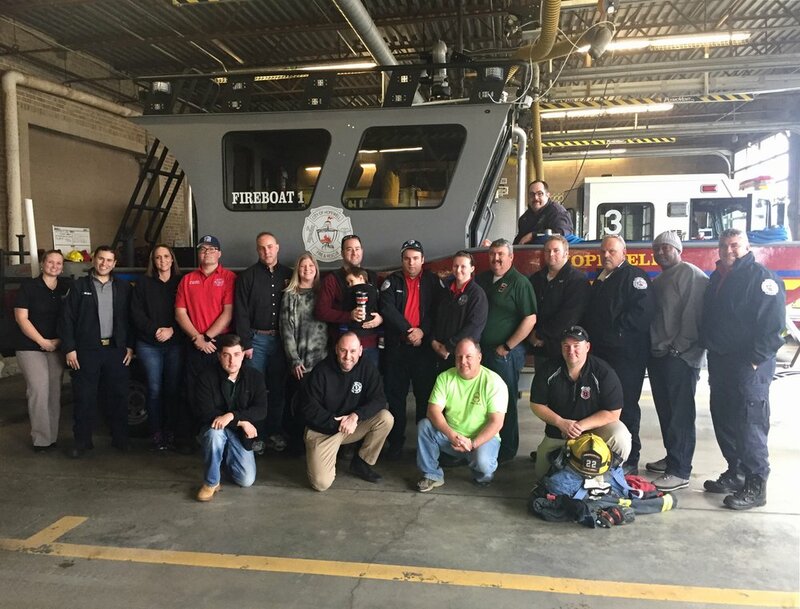 Members of Hopewell Fire and Navy Region Mid-Atlantic Fire & Emergency Services learned how to be peer support mentors and how to better help their brothers and sisters in the fire service. Keith Link - Harrisonburg, Va.
Erin Stehle - Harrisonburg, Va.
Wesley Meadows - Harrisonburg, Va.
Eric Higgs - Harrisonburg, Va.
Andrew Bauserman - Harrisonburg, Va.
Joseph Weaver - Harrisonburg, Va.
Stephen Morris - Harrisonburg, Va.
Dianna Chandler - Chaplain, Harrisonburg, Va.
Pamela Monger - Harrisonburg, Va.
Tyler Burgoyne - Harrisonburg, Va.
Dinah Watson - Retiree, Harrisonburg, Va.
Megan Mawyer - Verona, Va.
Josh Mawyer - Verona, Va.
Benjamin Gomes - Hopewell, Va.
Zachariah Franklin - Harrisonburg, Va.
Fiona Albertson - Rockingham County, Va.
John Coaker - Rockingham County, Va.
Steven Ison - Salem, Va.
Jonathan Lang - Fort Belvoir/Fredericksburg, Va.
Adam Hanger - Middlebrook, Va.
Misty Walker - Verona, Va.
Travis Moyers - Augusta County, Va. - Lt.
TJ Halsey - Augusta County, Va. - Lt.
Nicole Hughes - Verona, Va. Buddy Hughes - Verona, Va.
Steve Sprouse - Verona, Va. - Lt.
Robert Hilley - Harrisonburg, Va.
Dennis Albertson - Rockingham County, Va.
Greg Coffman - Harrisonburg, Va.
Stanley Barbour - Staunton, Va.
Timothy Putnam - Navy Region Mid-Atlantic Fire & Emergency Services, Va. Beach - Lt.
Shawn Faessel - Navy Region Mid-Atlantic Fire & Emergency Services - Lt.
Chris Bradley - Navy Region Mid-Atlantic Fire & Emergency Services - Lt.